I hadn't played fantasy baseball since 2006, the year I drafted Derek Jeter first overall and the other people in the league (one claimed his name was "Dave", sounded made up) said I was a fool. Then Jeter hit .343 and I won the league (I also had Johan Santana and Carlos Beltran, but I think Vinny from Jersey would agree that Chewing On Derwood Morris' Fingers doesn't win without Jeetah). 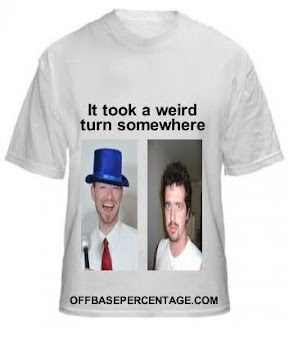 From 2007-2012 I skipped fantasy baseball season. I just didn't have time because I get so wrapped up in the NFL Draft. Anyway, fast forward to late-April, 2013, and we have Lavelle Rondo Apologists, the first Derwood Morris-led fantasy baseball team in seven years. Today was draft day in the Federal League at cbssports.com, and Lavelle Rondo Apologists had the fourth overall pick. The following is a running account of how it went. 10:53 a.m. - Awake in time for my usual pre-draft ritual of grapefruit juice and jelly beans. Said out loud: "Todd Helton is still active?!" 11:00 a.m. - Draft begins. It feels just like Opening Day, except no actual games are being played, I'm in my apartment and my cat just threw up the ceremonial first paper clip. First three picks: Ryan Braun, Bryce Harper and Justin Upton. That coincides with my draft board, which has a drawing of a man with a salami sandwich for a head. 11:04 a.m. - With the fourth pick of the draft, Joey Votto becomes the first member of Lavelle Rondo Apologists. Like all members of the Apologists, Votto will soon be mailed an eight-ounce bottle of peanut shells. 11:13 a.m. - In the second round, Buster Posey becomes our team's second member. It's the second time I've had a guy named Buster in my fantasy career (Buster Bray, 1941. Finished eighth). 11:15 a.m. - 'From Worst to First' picks Cubs' shortstop Starlin Castro with the 19th overall pick. The first Cub has been taken, so I do a celebratory shot of mustard. Motivational poster just hung on my wall: CLUBHOUSE PRESENCE. 11:17 a.m. - 11:20 a.m. - After each of the next six players is selected, I yell out "I wanted that guy, Sam!" to give the appearance that a guy named Sam is in the room drafting with me. 11:21 a.m. - Giants' pitcher Madison Bumgarner becomes a member of LRA with the fourth pick of the third round. Bumgarner also becomes the early favorite in pin the tail on Buster Posey at the post-season Banquet/Let's Gather Around And Look At My Road Atlas (September, 2013). 11:23 a.m. - The Apologists take Ryan Zimmerman in the fourth round leading to league-wide speculation that Norichika Aoki will next be off the board. 11:24 a.m. - 'BadNewsBros' select Norichika Aoki. 11:29 a.m. - The pitching staff is starting to take shape as Mat Latos is added with the 44th overall pick. 11:34 a.m. - Rickie Weeks is the last of four Brewers to be drafted in the fifth round. In the words of famous manager Poog Cronin, "never underestimate fresh legs." 11:38 a.m. - 11:45 a.m. - Next two picks are Dexter Fowler, who will be called 'Dex' in the clubhouse, and the subject of MTD's tell-all book I Watch You Brush Your Teeth, Chase Utley. 11:46 a.m. - We're in the eighth round now, so it's safe to pick players from the Marlins and 'Roscop45' selects Juan Pierre with the first pick. Seven spots later, LRA selects Pablo Sandoval. 11:49 a.m. - Clock is ticking in the ninth round.....and we get Starling Marte, which breaks my own pre-draft rule of no Pirates. Motivational poster just hung on my wall: TABLE SETTERS. 11:53 a.m. - Break my second pre-draft rule of no Cubs by picking Alfonso Soriano, who had one home run and 2 RBIs through Monday. He's also tied for second in the NL in games played with 25. Said out loud after checking league rules: "Oh, I guess games played is not a statistic in fantasy baseball." 11:58 a.m. - While searching for information on Nolan Arenado, (searches included 'Rockies players', and 'is this how you spell "Arenado"'? ), the auto pilot kicks in and drafts Jason Kubel for me in the 11th round. 12:01 p.m. - 12:11 p.m. - Next five picks: Domonic Brown, who will be called "Dom-Dom" in the clubhouse; Jaime Garcia; Rafael Betancourt; Hyun-Jin Ryu, who will also be called "Dom-Dom" in the clubhouse; Nate Schierholtz. This thing is 29 rounds?! 12:24 p.m. - We add Jorge De La Rosa, Bobby Parnell and Santiago Casilla to the LRA bullpen in rounds 19-21. And it's time for the 21st round toenail clip. 12:30 p.m. - Colorado third baseman Jordan Pacheco taken with the 217th overall pick. 217th in your programs, 838th in your hearts. Said out loud: "J.J. Putz is still active?" 12:35 p.m. - Another round, another shortstop to compete with Ruben Tejada for at bats as Billy Hamilton is the newest member of LRA. Helton drafted in the 24th round by 'Sauk Centre Mainstreeters'. I yell out "can you believe it, Captain Abraham, someone drafted Todd Helton!" to give the appearance that someone named Captain Abraham is in the room drafting with me. 12:41 p.m. - Matt Belisle and Francisco Liriano are taken in the 25th and 26th rounds. Two picks after Liriano, 'From Worst to First' selects Yasiel Puig. My draft board, which is a used envelope with 'Teen Wolf Three: Uncle Howard's Revenge' written on it, had Yasiel Puig going in the 28th round, so that's a steal for 'From Worst to First'. 12:48 p.m. - I'll remember my 2013 fantasy draft for one thing and one thing only: the moment I knew that Miguel Olivio would fall to me in the 27th round. 12:54 p.m. - Final two picks are Frank Francisco and Wily Peralta, who will always be addressed as a duo in the clubhouse: "Pastramiears". Last player taken is Brandon Inge. And finally, we've chosen a team logo!